How dark is your child’s room? How noisy is your child’s room? Do they have a TV, mobile phone, tablet or computer in their room, if so what are the rules for there use? How old is their bed? Does it ever gets used as a trampoline? Is your child sharing with a disruptive sibling? What sort of pillow are they sleeping on? How old and clean is the pillow? What sort of bedding are they using? How is the room in the dark, are there any potentially disturbing shadows? With the answers to these questions in mind, here are some tips and kids’ bedroom ideas to help create a bedroom environment designed for sleep. Sleeping Environment – A child’s bedroom is often using for more than sleeping, it can be their playroom, study and living room. It is important to remember the primary purpose of the bedroom is for sleeping, so ideally time in the bedroom is kept tranquil and restful, especially prior to bedtime. Colours – Forget blue for boys and pink for girls, there are other colours and combinations that may be better suited for your child. 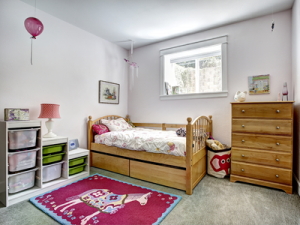 Tailoring a room to your child’s needs shows them that it is important. Maybe consider dividing the room into zones, with different colours or designs for different activities. Pale shades of pink help send a child off to sleep and green helps them feel refreshed in the morning. 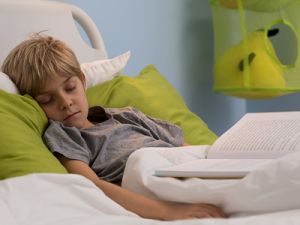 Temperature – Research has shown that both adults and children sleep better in a cooler room. Your should be aiming for around 16-18 degrees Celsius where possible. Noise – Generally toddlers tend not to be as distracted by noise as adults once they have gone to sleep. This means you don’t need to be creeping around the house trying not to make a sound, the more they get used to background noise when sleeping the less likely they will be disturbed when older. Smell – A clean fresh-smelling bedroom is a much nicer sleeping environment, any air freshener should be used sparingly and not to disguise smells that need to be dealt with in the bedroom, i.e. rotting food or dirty clothes. Open a window every day can help keep the air fresh. TV, Mobile Phones and Computers – In general it is better not to have these in a child’s bedroom or their use restricted where possible. Reading a book is a much better aid for a good night’s sleep. 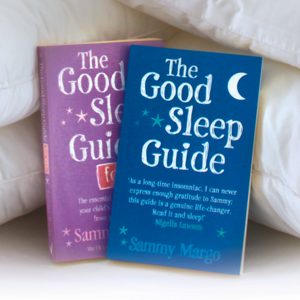 For more kids bedroom ideas and advice for helping your child sleep see The Good Sleep Guide Kids Edition. You might also want to take a look at our Slim Pillow if your child needs a replacement pillow.